Celebrate the Magic of Live Music! We're very excited to announce our 2015-2016 season! "Kenneth B. Andrews has traded in his conductor’s baton for a magician’s wand for the 28th season of the Orchestra of Northern New York. The theme of the six-concert 2015-16 season is 'Celebrating the Magic of Live Music.'" Read more from the Watertown Daily Times here. ONNY Goes to the Movies! 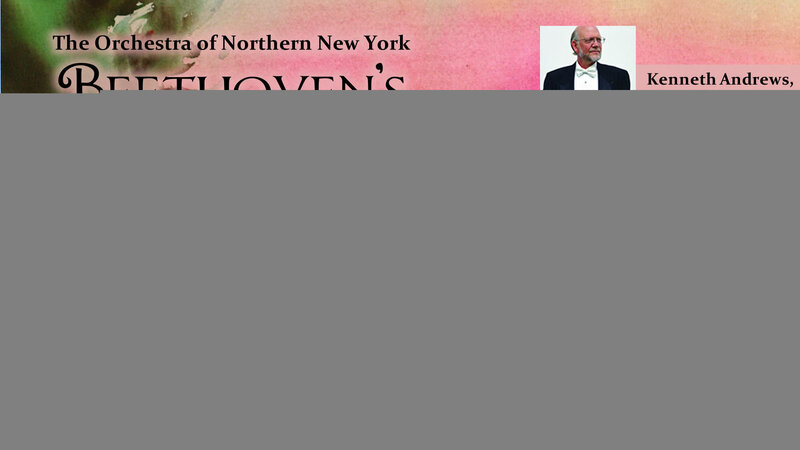 Welcome to The Orchestra of Northern New York’s 28th Season! Welcome to The Orchestra of Northern New York’s 28th Season — The Magic of LIVE Music! Join us for a wide array of soul-stirring orchestral works, from the great classics to lighter, familiar and celebrated pops. We have something for everyone that will satisfy the wide variety of our listeners’ eclectic tastes. Enjoy great music performed by brilliant soloists and inspired professional musicians from Northern New York and beyond! I look forward to seeing you at our concerts in the coming year. Chip Lamson will be guest conducting the orchestra this week for John Philip Sousa's Semper Fidelis March. Join us on Wednesday at 7 PM in Hosmer Hall, SUNY Potsdam and Thursday at 8 PM in Thompson Park, Watertown. Guy (Chip) Lamson is a music educator with thirty years of high school experience in the Massena Central School District. During his tenure, he taught courses and classes in voice, music theory, composition, music history and literature, guitar, class piano, and music theater, as well as directing mixed choir, women’s chorus and three vocal ensembles. He also directed and conducted both fall and spring musical productions annually. Additionally, he coached both basketball and track. For ten years he was a music director and conductor for Music Theatre North, a regional summer stock theater located in SUNY Potsdam’s Snell Hall. He has served in the New York State School Music Association as sectional festival general chair, choral chair, accompanist, and conductor. Lamson has been a NYSSMA Conference All-State clinician, and a session accompanist for Alfred, Shawnee Press, Hal Leonard, Theodore Presser and other publishers. He has served as both conductor or accompanist for numerous high school jazz festivals in New York. He is a past president of the St. Lawrence County Music Educator’s Association, and has served the SLCMEA All-County Festival as general chair, choral chair, accompanist and conductor. Since retiring from Massena, he has worked at SUNY Potsdam’s Crane School of Music as an adjunct professor, teaching functional piano to instrumental music majors, and assisting Carol (Kickie) Britt in both fall and summer course offerings in vocal jazz. For the past two fall semesters, Lamson has directed the Crane Men’s Ensemble. In addition, he serves as a piano accompanist for several dozen Crane instrumental and voice majors. Lamson performs regularly as a keyboard player and vocalist in several blues and rock bands. He has recorded seven CDs, most recently in November of 2014. POTSDAM - The Orchestra of Northern New York invites the public to bring a veteran to its summer pops concert on Wednesday, July 1 when it presents a musical tribute commemorating the end of the Civil War and World War II. Last year, several veterans in the audience were recognized for their service to our country. Local businesses and individuals treated veterans to a concert ticket giving them the opportunity to be thanked publicly. Tickets for active duty military personnel and veterans are discounted at $18 - a savings of $4 off adult tickets. To purchase tickets, call 267-2277. POTSDAM - A musical tribute commemorating the end of the Civil War and World War II, along with selections from popular movie soundtracks, will be featured when the Orchestra of Northern New York presents its popular Summer Pops Concert on Wednesday, July 1 at 7:00 p.m. in Hosmer Hall, SUNY Potsdam. The program begins with American Salute followed by the Battle Hymn of the Republic and Armed Forces Salute. Guest conductor Guy C. "Chip" Lamson will lead the 55-piece orchestra in John Philip Sousa's rousing Semper Fidelis March. The first half of the concert ends with selections from the Band of Brothers. After intermission, ONNY goes to the movies with selections from Star Wars, Breakfast at Tiffany's, The Fellowship of the Ring, Titanic, Frozen, and Jurassic Park. Tchaikovsky's 1812 Overture concludes the concert. Tickets are $22 adults, $18 for seniors (62+) and military personnel, and $5 for students, ages 6-17. Children five and younger are free. Call 267-2277 to purchase tickets. During intermission, drawings will be held for the four prizes in the 2014-2015 Season Raffle. Prizes include a two night stay at the Siam Classic Inn & Spa, a loaf of bread a week for three months from the Co-op's Carriage House Bakery, a gourmet dinner for four prepared by chef Wally Siebel and served by Maestro Kenneth Andrews, and gift certificates for a massage, manicure, and local dress shop. For more information about the raffle, contact the ONNY business office at 267-3251 or onnybusiness@gmail.com. POTSDAM - Beethoven's ever-popular Symphony No. 4 will be featured in the spring concert by the Orchestra of Northern New York. Performances are 7:30 p.m., Saturday, April 25 in SUNY Potsdam's Hosmer Hall and 3:00 p.m., Sunday, April 26 in the Dulles State Office Building, Watertown. Described as "a slender Grecian maiden between two Nordic giants," (referring to his Symphonies 3 and 5), Beethoven's Symphony No. 4 in Bb Major, Op. 60 will anchor the program. In general the symphony is sunny and cheerful, with light instrumentation in a manner that recalls the symphonies of Joseph Haydn, with whom Beethoven had studied a decade before. The Fourth Symphony contains many aspects that show his growing strength as a composer. Also to be performed are the brilliant Dances of Galanta by the magnificent Hungarian composer, Zoltan Kodaly, and the magical Overture to The Abduction from the Seraglio by Mozart. Founding music director Kenneth Andrews will conduct the 52-piece orchestra. The maestro also will host a pre-concert conversation featuring members of the orchestra 45 minutes before each of the concerts. The orchestra's mission is to enrich the quality of life in Northern New York through live performances of orchestral music by outstanding musicians and to emphasize the engagement of area youth in the appreciation of music. Tickets are $22 for adults, $20 for seniors, and free for children, 17 and younger. For tickets, call 315-267-2277 or visit www.onny.org. POTSDAM - Have you ever dreamed of conducting a professional symphony orchestra? This might just be your lucky year! The Orchestra of Northern New York is raffling off the chance for someone to conduct the 60-piece Orchestra in a selection at its summer Pops concert, "ONNY Goes To The Movies," on July 1, 2015 in Hosmer Hall at SUNY Potsdam. Drawing is Saturday, April 25 during intermission of the spring concert, Beethoven's Fourth Symphony, in Hosmer Hall. The winner gets two free conducting lessons from Music Director Kenneth Andrews, and the opportunity to conduct a march by John Phillip Sousa at the July 1st concert. Anyone, 18 or older, may purchase a raffle ticket to win this prize or one of the other prizes in the 7th annual season raffle. Other prizes include: "Siam Classic Inn & Spa Experience"- two free nights and gourmet breakfasts at the only Thai-style bed & breakfast in the region; "Co-Op Bread Blowout" - one loaf a week of your choice of mouth-watering bread for 12 weeks; "Fun for Foodies" - an evening of delicious food from Chef Wally Siebel, cooked and served in your own home, with waiter Maestro Kenneth Andrews; and "Gift Certificate Delights" - one hour massage from Bliss Massage, a manicure from Inspired Healing Salon and Spa, and a $20 gift certificate to the Carol Lee Shoppe. Tickets for this popular ONNY fundraiser are $10 each, or five tickets for $40. For more information, or to purchase tickets for this prize, or other prizes, call 267-3251. On Saturday, January 31, Christopher Spinelli won the 9th Annual James and Katherine Andrews Young Artist Instrumental Competition was held in Hosmer Hall at the Crane School of Music. He will perform the Schumann A Minor Concerto with the Orchestra of Northern New York in the upcoming Fantasy, Fables, and Folklore! concert. Below is a brief biography of this young artist. Christopher Spinelli is a junior at Fayetteville-Manlius High School in Syracuse. A three-consecutive year winner of the CNYAMT Piano Competition, he entered and won the senior division at age 14. At age 12, and again at 16, he was a finalist in the Syracuse Symphony Youth Concerto Competition. He has participated in various piano competitions in Upstate New York, including the Thousand Islands International Piano Festival and Competition for Young People at Cape Vincent. He also participated in the Civic Morning Musicals Wednesday Recital Series in 2014. Chris enjoys sports from basketball to longboarding, and relaxes by initiating improvisational Jazz sessions with his Dad. A high honor roll student, he excels in Latin, and enjoys writing. He has served as accompanist for his high school's Jazz Chorale and as organist for his church. Both Christopher and his parents credit his musical accomplishment to his teacher John Spradling’s expertise, passion, patience and teaching style. An exciting and fun-filled concert that will have your imagination soaring as we explore how composers create great music based on ideas from Fables, Fantasy and Folklore! See the full concert listing, and purchase tickets, here.